At the first sign of unwanted animals in your home, it is important to contact a licensed and insured animal removal service like Critter Control® Miami. As a family-owned business serving Coral Gables, Miami-Dade and Monroe Counties area for over two decades, you can trust our expertise to help rid your home of unwanted critters quicker and safer than any other animal removal companies. To learn more about what specific services we offer, give us a call at 305-258-3587. We can provide relief to homes that are suffering from opossums or armadillos digging at the foundation, snakes that snuck into the garage, rats, mice, or squirrels that have made their way into the attic, and even raccoons eating from the trash. When you call us for your free consultation, we’ll send out a friendly and knowledgeable technician right away to assess the infestation and determine what the best method of removal is. At Critter Control® Miami, we understand that these critter incidents aren’t just found in the home, which is why we also offer commercial wildlife services. Since the goods and services you provide in your company or business tend to have a higher value than what you have in your home, a commercial infestation could end up costing you much more. To protect your employees, expensive machinery, and assets, trust Critter Control’s® expert exclusions services. What truly sets us apart from our competition is not just quality and care of service, but the extent our services can go. After the infestation has been properly removed from your home or business, we’ll stay and make sure your home is restored to the way it was. This can be as simple as safely removing all residual urine and feces, or a bigger project like completely rebuilding the insulation in your attic and walls. And with our proven four-step method, you can rest assured you won’t have another infestation. For emergency wildlife problems, you can contact us directly by calling 305-258-3587. If you would like to set up an appointment with a technician, you can fill out one of our online forms to get into contact with our office, located at 5195 NW 74th Ave Miami, FL 33166. 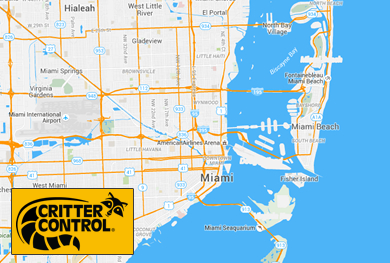 For 24- hour, reliable service, trust the experts at Critter Control® Miami.